Having collected our yacht from Fairview Sailing much debate ensued as to where we should go this first evening. Top of the list was a night entry into the Beaulieu and stay over at Buckler’s Hard. 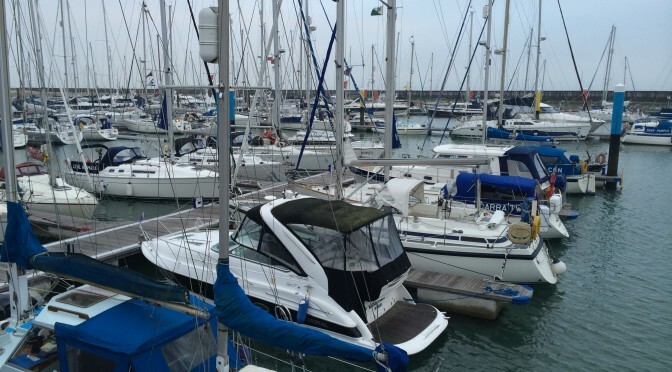 We all were keen to avoid yet another stopover at Cowes and this was reaffirmed when we found out that there was a regatta basing itself at Cowes Yacht Haven. The alternative was to sail over to Yarmouth and have dinner in Saltys. Of course, we’d need to leave soon if that was an option. I was most in favour of Beaulieu – to tick a night entry off the list when it was safe with wind around 10 knots, sea state very slight and having the excellent sectored lights to guide us in through the narrow approach. The problem was LW was 1900 hours meaning we’d have to hang around until 9pm before it was safe to cross the bar. We weren’t at all convinced we could stand a 4 hour dawdle. So we set off around 1740, backing out of the marina finger and then ferry gliding out against a strong down stream current. We put the sails up in Southampton Water and made our way towards Yarmouth. As so often happens the log was reading 0 knots and so I went off to clean it. We were now getting a reading but it seemed far lower than reasonable. We were later advised it was likely due to the crud building up around the sensor fitting – not good enough really. As darkness fell around 1930 we weren’t far past the Beaulieu after all and we could see the occulting light from the other side of the Solent. The tide was very strong and we made our relatively close to the island shore to try and minimise this. Our yacht was equipped with radar so we switched these on in an effort to experiment with interpreting its output. It was fairly fiddly I felt but you could definitely make out land of course but also other yachts and at times buoys. In fact we identified one unlit buoy and referenced it to the chart about 0.3m off our bow. With some training I could see how it could help, but without it was obviously a dangerous thing to rely on. We rolled away the jib and centred the main and made straight for our waypoint under engine as we weren’t making enough progress against the tide and were hungry. Mark heated up his curry and we ate en route and arrived at the red buoy just outside Yarmouth at 2110 and motored in very carefully. Night time makes you very careful but the tidal currents are very strong at Yarmouth so you need reasonable power. We were quickly allocated a berth on pink pontoon in front of a large wooden gaffer next to the slipway. The tides were extremely strong, as was the wind all of a sudden – it was pulling us into the main pontoon area towards the Yar. I didn’t really want to have to circle round again and the guys were quick to set lines and fenders. We all agreed it was massively reassuring that we each could rely 100% on the others ability to step off and make good our lines quickly. During the night we were hit with a strong combination of wind and tide. They were both conspiring to lift the boat out of the water and slam us back down again. All three of us were up (well I spoke through my cockpit window) convinced we’d be slammed against the pontoon, wondering if we’d wake up and find us sat on the quay.